What Else Can I Expect from an Online Applied Psychology Program? Applied psychology is a multidisciplinary field that uses principles and theories of clinical, behavioral and organizational psychology to address real-world problems related to human behavior and interaction. Applied psychology is utilized in a wide range of industries. Marketers and advertisers use applied psychology to study consumer demographics and launch successful product campaigns; police officers, lawyers and other criminal justice professions rely on applied psychology to solve cases and prosecute offenders; and educators often study applied psychology to determine suitable lesson plans in their classrooms and schools. 'Psychology' and its subfields (such as applied psychology) are among the most popular majors for bachelor's degree-seekers. According to the National Center for Education Statistics, roughly 114,000 psychology bachelor's degrees were conferred during the 2012-13 academic year. However, careers in psychology require an advanced education; job candidates typically enter the workforce with a master's or doctoral degree. Additionally, psychologists in public practice must be licensed in all 50 states and the District of Columbia. A bachelor's in applied psychology will provide foundational knowledge and skills for students who are planning to obtain a graduate degree, complete their state-specific licensure requirements and compete for jobs in their field. Many of today's students are choosing to earn their bachelor's degree in applied psychology online, rather than in a classroom. Online students follow the same rigorous curricula as their brick-and-mortar counterparts, leading to the same number of post-degree employment opportunities. The asynchronous (or self-paced) format of many online programs is also ideal for students with part-time jobs, childcare duties and other commitments that may interfere with campus-based learning. Learn more about what you can do with an online bachelor's degree in applied psychology and what kind of career opportunities you can look forward to with this comprehensive guide. WILL AN ONLINE APPLIED PSYCHOLOGY DEGREE PROGRAM PROVIDE ME WITH THE SKILLS I NEED TO ADVANCE MY CAREER? For most students, a bachelor's degree in applied psychology will serve as an important stepping-stone for their career. The curriculum for an online applied psychology bachelor's will cover foundational areas of psychology, including cognitive, behavioral, developmental, social and organizational psychology. Students will also review case studies and become familiar with best-practice research methods, which they will be able to demonstrate as part of their practicum coursework. Although bachelor's degrees in applied psychology are widely available, many students receive their education as part of a bachelor's in psychology program with an applied psychology minor or specialization. The best online bachelor's in applied psychology degree programs will prepare students to advance into any master's pathway. WILL AN ONLINE APPLIED PSYCHOLOGY DEGREE PROGRAM WORK WITH MY SCHEDULE? Online applied psychology degree programs offer a flexible alternative to traditional brick-and- mortar education. Students can access course readings and lectures, submit written assignments, take exams and communicate with their professors on their own schedule. Current technology also enables them to study away from their home computer using a laptop, tablet, smartphone and other Wi-Fi-compatible devices. For added convenience, online psychology students can normally coordinate internships and other practicum courses at sites that are reasonably close to their current residence. WHAT JOBS CAN I GET WITH MY BACHELOR'S IN APPLIED PSYCHOLOGY? A bachelor's degree in applied psychology on its own will not be sufficient for a career in this field. In addition to state licensure, most positions require candidates to hold a master's degree ― and, in many cases, a doctorate as well. However, a bachelor's in applied psychology recipient may be eligible for certain positions outside the psychology profession. These candidates commonly land jobs in fields like marketing and advertising, human resources, criminal justice, law, education and social work. 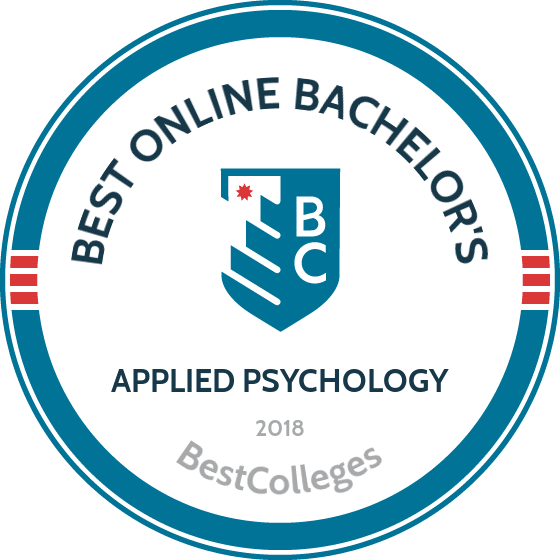 WHAT ARE THE BEST ONLINE BACHELOR'S IN APPLIED PSYCHOLOGY PROGRAMS? Choosing a program is an incredibly personal decision, and only you can properly evaluate whether a target school's strengths match your educational needs. The following ranked list of schools should serve as a helpful starting point in your search for the best online bachelor's degree in applied psychology programs in the United States. Our ranking is based on the courses schools offer, available specializations, student outcomes, career support services, and other criteria used to determine academic excellence. If you are considering an online bachelor's in applied psychology, be sure to contact admissions specialists at different colleges and universities to learn more their about specific bachelor's degree requirements and offerings. Located in Denver, Colorado, Regis offers a BS in applied psychology degree online that emphasizes psychological theories and their application to our modern world. The program's curriculum is Jesuit-based, and focuses on helping each student develop "as a whole person" through traditional and innovative learning experiences. Coursework is available completely online or on campus. Admissions counselors assist with the online application process and help new students get started with registration. The degree requires 120 credits total; 45 are core credits and the rest are foundational, upper-division, minor, or elective credits. Students wishing to pursue an additional degree can apply two of the courses to their counseling or family therapy graduate degree with permission of the academic chair. Student services available at Regis include the online library, which has more than 80,000 e-books, and an orientation course to help students become familiar with the WorldClass LMS. Regis is known for being military-friendly, with tuition benefits and a resource center for helping veterans pursue their degree. Tennessee’s Bryan College-Dayton delivers an entirely online degree in applied psychology through a Christian worldview. This perspective helps students evaluate human behavior using Christian ethical principles to make a difference in the lives of others. The college's motto, “Christ Above All,” is part of the school logo and is inscribed on several campus buildings. Bryan College-Dayton accepts significant life experience in place of college credit and makes it easy for students to learn online while working full time. Courses are offered at an accelerated pace in six-week terms. Students must earn 124 credits in order to graduate. Bryan College-Dayton is part of the Tennessee Transfer Pathway, which simplifies the transfer process for many public and private institutions throughout the state. Five start dates per year provide students the flexibility they need in beginning a degree program. The school boasts an estimable faculty, with 70% holding a doctorate or the highest degree available in their field. FIU offers a bachelor’s in psychology online program that is accelerated, convenient, and flexible. With courses that can be completed entirely online, FIU’s program offers renowned faculty and the same quality of education as is found in on-campus courses. A personal success coach is assigned to each undergraduate student to provide individual guidance. FIU's honors college is also available online, developing students' skills in problem-solving, communication, logical analysis, and cultural fluency. Academic coaches, advisers, and tutors are also available to help online students succeed. FIU's psychology program has start dates in fall, spring, and summer. The program boasts a diverse student body of more than 2,400 students. After completing prerequisites and a sequence of research courses, students choose between five areas of emphasis: cognitive and neuroscience, social psychology, applied psychology, clinical/personality, and developmental psychology. Students complete their degree with 12 credits of upper-division electives. Liberty University delivers an online bachelor’s in psychology that integrates contemporary theories into its coursework. Covering evaluation techniques, functions of the human body, and classification of neurotic and psychotic behavior, Liberty’s in-depth course content gives students the valuable knowledge they need to succeed. Students must complete 120 credits to graduate. At least 30 overall credits and 50% of credits in the major must be taken through Liberty. Liberty teaches from a Christian perspective, helping students understand behavior and development through this lens. The school offers seven concentrations in psychology, including addictions and recovery, crisis counseling, and life coaching. Graduates can continue their education in psychology with Liberty’s online master’s degrees in areas like human services, marriage and family therapy, and professional counseling. Liberty has six acceptance deadlines per year, making it easy to get started any time. Additional credits are offered for life experience, military training, portfolios, certificate programs, and various examinations. Founded in 1899 in Glendora, California, APU offers a BA in applied psychology online. The university assigns a success coach to each student to assist with things like financial aid, online classwork, career preparation, and life after graduation. Success coaches also offer prayer services and spiritual guidance. Within the online classes, interactive technology like chat and discussion boards make it easy to discuss topics with classmates and professors. The applied psychology degree is only available online, with eleven emphases for customizing study including clinical psychology, pastoral counseling, and human resource management. APU integrates a Christian worldview to evaluate ethical behavior and decision-making within the study of psychology. Students study various theories of psychology and learn different types of reasoning. In order to graduate, students must complete 60 credits of general studies and 60 credits for the major. SNHU in Manchester, New Hampshire offers high-quality academic programs, including a bachelor’s in applied psychology online. The school's psychology degree features emphases in addictions, applied psychology, child and adolescent development, forensic psychology, mental health, and social psychology. Study of the human psyche and leading research theories are key components of SNHU’s psychology programs. SNHU's online degree in applied psychology takes learning a step further through the study of real-world scenarios. Students can learn on their own schedule during six eight-week terms per year. SNHU does not charge an application fee and the school's generous financial aid packages make tuition affordable; additionally, the school offers a 30% tuition discount for active-duty service members and their spouses. Students can transfer up to 90 credits to SNHU. An online psychology club and international honor society connect students with each other and provide a network of alumni and opportunities. Judson University in Elgin, Illinois features an online degree in applied psychology, also available on campus, designed for working professionals. Applicants must have two years of full-time work experience, 40 college credits, and a GPA of at least 2.0. Students conduct and present research projects while developing assessment, counseling, and intervention skills. These projects help students discover how individuals and groups behave in different settings. Instructors have advanced degrees and work in psychology or related fields. Judson’s online bachelor’s in applied psychology requires students to complete 46 credits in the major, with courses on subjects like faith and life issues and applied positive psychology. Students gain the foundational skills needed to succeed in graduate studies or various career paths, including oral and written communication skills, interpersonal skills, and knowledge of legal and ethical issues. Online resources include a library database and bookstore. Oregon Tech in Klamath Falls, Oregon delivers an applied psychology degree online. The program gives students in-depth knowledge of psychology and helps them develop skills in specific areas like behavior modification and counseling. In completing their coursework, students discover their own strengths while creating and implementing new ideas. The program prepares students for graduate studies or a career in psychology. Externships give students work experience at businesses or agencies during any term and any locale. In addition to the core curriculum, applied psychology students at OIT personalize their degree with electives. Classes are available in quarters, with three ten-week terms during the academic year and a shorter summer term. Tuition is the same for all students, whether in- or out-of-state. Oregon Tech offers financial aid and scholarships specific to certain majors and types of achievement to help alleviate the cost of tuition. Hodges University has an online degree in applied psychology that is also available on campus. The program's curriculum gives students a foundation in liberal arts combined with practical and theoretical application of psychology, offering students both the “soft” people skills and knowledge they need to succeed. Beyond the psychology core, students choose electives and liberal arts areas of emphasis to complete the requirements for the major. An on-campus certificate for substance abuse certification is offered for students who want to supplement their degree. Students can complete the applied psychology program in three years if they take three courses per term and follow the optimum sequence of coursework. Faculty bring real-world experiences to the classroom and are known for providing personal attention to help students excel. Courses are self-paced through UPOWER, with classes starting the first day of each month. Previous work experience can count towards the degree program. Located on Florida's east coast near Kennedy Space Center, FIT places student success at the top of its list of core values in education. Designated a Tier 1 Best National University by U.S. News & World Report, the school offers more than 85 degrees both on campus and online. FIT delivers an applied psychology degree online, covering topics like mental and physical health, business management, product design, and law. The program, which has no mandatory in-person components, includes five areas of concentration, including child advocacy and forensic psychology. Students study empirical research and historical trends to develop an in-depth understanding of theoretical perspectives in the field. Taking classes in eight-week terms, students usually complete the required 121 credits for the degree within four years. Graduates generally seek employment in fields like social and behavioral sciences, marketing, and sales. Alternatively, some graduates progress to graduate studies in psychology or related fields. For students who earn a bachelor's in applied psychology, the job outlook is somewhat mixed. The Bureau of Labor Statistics (BLS) notes that bachelor's degree-holders report lower unemployment rates than candidates with lesser educational credentials. The median unemployment rate for a bachelor's degree-holder in the U.S. is 2.8%; by comparison, the unemployment rate for associate degree recipients is 3.9%, while the unemployment rate for all occupations is currently set at 4.9%. However, psychology and its subfields are highly specialized and unemployment rates are much higher for bachelor's degree-holders in these industries. Using data from the National Center for Education Statistics (NCES), the following table looks at the unemployment rates of college graduates between the ages of 25 and 29 based on their undergraduate major. As the table indicates, the unemployment rate for psychology degree-holders is significantly higher than most of the other majors. However, the employment outlook is much stronger for psychology degree-holders who advance to master's and doctoral programs. In addition to degree attainment level, salary expectations for employees with a bachelor's in applied psychology will largely depend on their specific job title. Other factors include licensure status and city/state of employment. Using data from PayScale, the next table examines career salary projections for five of the most common professions in behavioral psychology. All of these career paths are generally attainable with a bachelor's degree or less. All five careers listed on the table reported a salary growth rate of at least 15% after 20 years in the workforce. Marketing managers experience the highest rate of growth: a 41.4% increase in earnings between the entry-level and late-career stages. Behavior analysts and ABA therapists ranked second in terms of salary growth; both career paths reported a career increase of roughly 40% after two decades on the job. Students who earn an online bachelor's in applied psychology will be well-positioned for the demands of successive master's and Ph.D. programs, as well as their state's licensure requirements after receiving an advanced degree. However, many bachelor's in applied psychology recipients will enter the workforce after graduation and launch a career in a non-psychology field without obtaining higher credentials. Four common career pathways for individuals who complete their education with a bachelor's in psychology are outlined below. Human Resources Specialists: HR specialists handle recruitment, screening and hiring of job applicants, as well as orientation for newly acquired employees. Depending on their organization's size, they may also work in other areas of HR, such as compensation and benefits or conflict mediation. Social Workers: Social workers aid clients who require assistance in different aspects of everyday life, such as job training, employment and mental health counseling. They often rely on applied psychology to determine their clients' greatest needs, as well as suitable ways for them to achieve their goals. Clinical and non-clinical social workers must be licensed in most states. Market Research Analysts: Market research analysts lean on applied psychology to determine where, why and how different segments of the population respond to ― and purchase ― various products and services. They must analyze a wide range of data metrics related to both consumer trends and market activity in order to launch successful marketing campaigns and promote products. Training and Development Managers: Training and development managers are responsible for educational programs that equip employees at their organization with essential knowledge and skills. They often study their company's personnel needs, and will use applied psychology principles to determine which training and development programs are suitable for different employee groups. Students who graduate with a bachelor's degree in applied psychology often go on to pursue a master's degree in the same field. For more information about opportunities for grad students and more advanced careers in this field, please visit our Guide to Online Master's in Psychology Programs. Making professional connections and learning about different approaches to applied psychology is crucial to your success. Professional organizations offer a great entry point for students who want to learn more about their chosen career path. Below you'll find three of the country's most prominent organizations established for applied psychology professionals. These organizations host networking events, provide online trainings, maintain active job boards, and offer other services for career-ready college graduates. International Association of Applied Psychology: The IAAP was created in 1920, and today boasts more than 1,500 members from over 80 countries worldwide. Member benefits include complimentary journal and newsletter subscriptions, reduced fees for industry events and continuing education opportunities; membership discounts are offered to students and candidates from 'low-income' countries.